The Darkened Vault.. The Dread of not knowing what surrounds us, our terror growing as we are engulfed in the darkest shadows, our weakened skeleton shaking with fear..yet still we venture in deeper and deeper. The Vault is an easy-to-use modular style construction kit for creating your very own vaults in poser, but with this pack we have made that even easier and quicker for you to use. 10 Pre made saved pz3 scenes already constructed so all you need to do is simply open the scene you want to use and add your own touches and characters.. 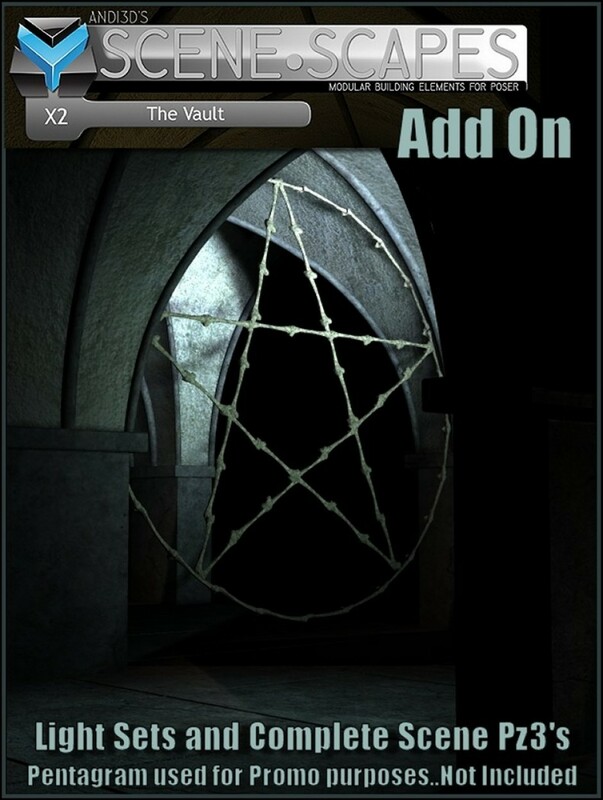 The vault Add On also comes with 26 stunning optimized lights to create all sorts of funky shadows and effects.